Kiyomizu-dera (or Kiyomizudera, 清水寺) refers to several Buddhist temples but most commonly to Otowasan Kiyomizudera (音羽山清水寺) in Eastern Kyoto, and one of the best known sights of the city. The temple dates back to 798, but the present buildings were constructed in 1633. The temple takes its name from the waterfall within the complex, which runs off the nearby hills — kiyoi mizu (清い水) literally means pure water. 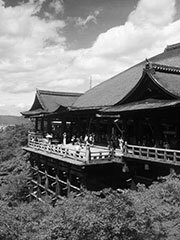 The main hall of Kiyomizu-dera is notable for its vast veranda, supported by hundreds of pillars, which juts out over the hillside and offers impressive views of the city. The expression «to jump off the stage at Kiyomizu» (「清水の舞台から飛び降りる」) is the Japanese equivalent of the English expression «to take the plunge». This refers to an Edo period tradition that held that, if one were to survive jumping from the stage, one’s wish would be granted. This appears plausible: the lush vegetation below the platform might cushion the fall of a lucky pilgrim, though the practice is now prohibited. 234 jumps were recorded in Edo period and of those, 85.4 percent survived. The fall is indeed only 13 metres, which remains impressive for a wooden construction. Beneath the main hall is the waterfall Otowa-no-taki, where three channels of water drop into a pond. Visitors to the temple collect the water, which is believed to have therapeutic properties, from the waterfall in metal cups. It is said that drinking the water of the three streams confers health, longevity, and success in studies. The temple complex contains several other shrines, notably Jishu-jinja, decidated to Okuninushino-Mikoto, a god of love and «good matches». Jishu-jinja possesses a pair of «love stones» placed 18 metres apart, which lonely visitors attempt to walk between with their eyes closed. Success in reaching the other stone, eyes closed, is taken as a presage that the pilgrim will find love. One can be assisted in the crossing, but this is taken to mean that an intermediary will be needed. The persons romantic interest can assist them as well. The complex also includes all the fixtures of a popular temple, being one of the most-visited attractions of the city: hawkers offering various talismans, incense, and o-mikuji (paper fortunes ranging from «great fortune» to «great ill») abound. Indeed the high popularity of the place means that tourists will find it difficult to take pictures on the main temple’s platform.